"Vaccines save lives; fear endangers them. It's a simple message parentÃÃÂ need to keep hearing"
There was a time when whole world was struggling with diseases as no vaccines were there, in fact, in the 20th century around 300"ÃÃÃÂ¢500 million people died due to smallpox. Then in the year 1796 first vaccine was developed for smallpox and vaccines are cost-effective health care interventions. Then why every year people die from vaccine-preventable diseases in India and many other countries? Is it that people do not have knowledge about vaccines or the vaccines are expensive? The reasons are many, but one of the major reasons is: In India, a number of women are there who cannot read and write, so considering that how can they read the correct dates and name of their Child's vaccine? To prevent such problemsÃÃÂ recently researchers have innovated a system for tracking vaccination- Khushi Baby. Support us on our Bitgiving crowdfunder this month and help spread the word! Every contribution will go directly to the mothers and infants we hope to serve. 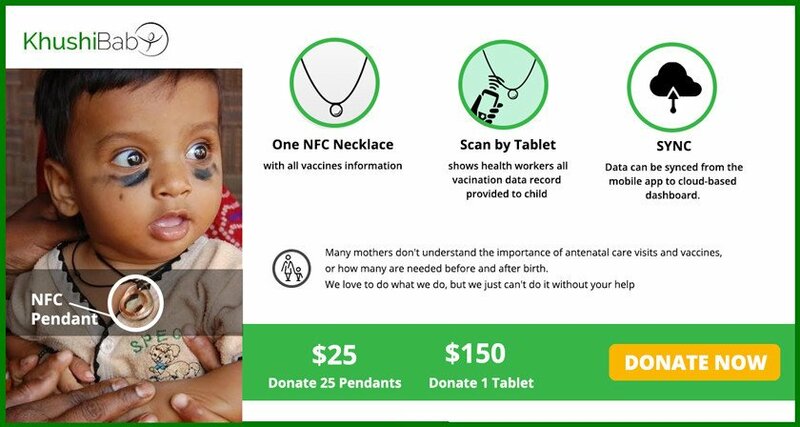 Khushi Baby is an integrated mobile health service which is having a wearable NFC technology pendant with cloud computing and having information on child's vaccination with updating facility; and a perfect technology to bridge the gap of world's vaccination. The newborn child has to wear the simple pendant and when health workers come to give the vaccine to the newborn child, they can simply scan Khushi Baby pendant with provided device and the health workers will get their complete vaccination detail. The Khushi baby is founded in YALE university by Ruchit Nagar, Mohammed Shahnawaz from IIHMR is handling Khushi Baby operations, Sanjana Malhotra, a graduate from Columbia university and Preethi Venkat from YALE university and others, there is also a team of interns, researchers, designers and social media coverage team. 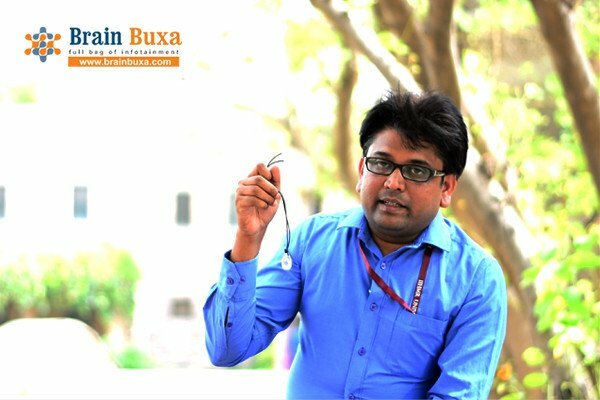 Mohammed Shahnawaz, the Indian researcher at Indian Institute Of Health Management Research (IIHMR) is looking into field operations, research and randomized controlled trials for Khushi Baby. Mr. Shahnawaz apprised us that, "John Hopkin's university has collaborated with IIHMR and providing funding for this project Khushi Baby. I came in contact with Khushi baby project, 2 years back, started at Yale university as a classroom project". "There are about 1.5 million people who die due to lack of knowledge of vaccine-preventable diseases, so to improve child immunization we are testing Khushi baby in Udaipur with some local NGO's at Seva Mandir and having about 100 outreach camps who works for maternal and child care services. ÃÃÂ The Khushi Baby consists of a pendant made of near field communication device having a chip embedded in the system which holds less than 1 KB of the record. This will replace the paper immunization card system and is less prone to loss and mutation, also sometimes it is hard to look at the records, overall it supplements the work of health worker. Now with Khushi Baby, the health workers ÃÃÂ just have to update the chip and tab and when they go in network area they sink it", says Shahnawaz. Mr. Shahnawaz gladly said that "This is a win-win situation for theÃÃÂ health worker,ÃÃÂ childÃÃÂ and parent. As the health worker can simply enter the data than waiting for a long time at theÃÃÂ door to door, the child will get the vaccinations timely and parents don't need to keep up the database of their child vaccinated." For the present scenario, the Khushi baby team is holding a record of 1500 babies and planning to scale up with the district health department of Udaipur where they are evaluating the system in around 300 villages. The team is also maintaining records of ANC i.e. Anti Natal Care which is important for anÃÃÂ overall continuum of ÃÃÂ maternal and child health. "We will provide the pendant to the mother at the first ANC level and then we will check the child immunization in DTP3 level, our primary outcome will be how many mothers are completing required four ANC's," says Shahnawaz. This is aÃÃÂ water-proof pendant, one can try blemishing it, nothing will happen it to. Also, the pendant is culturally right as it is tied with a black thread and in India, its acceptance is quite high. Awards and prizes are motivation for all of us, but when it comes to innovationÃÃÂ a lot of money or you can say aÃÃÂ helping hand is necessary. The team of Khushi baby has received many awards for the innovation which includes, young research grants from the John Hopkins University and Shahnawaz told us that they are planning to use this money for the efficacy of the system with the government. TheÃÃÂ Team has also received, Wearables For Good Challenge award by UNICEF innovation, then they received an amount of 2.5 lakh dollars through 3IE (Innovations for Increasing Immunization Grantee) organization, also nominated for the Classy awards which are also considered as Oscar in the development sector. Team Khushi Baby believes that "No child should suffer from Vaccine-preventable Disease"
Brainbuxa wishes Khushi Baby project a very best of luck and we believe this will be one of the greatest innovations for the child vaccination. Hopefully India, in fact, the world will get freedom from huge data of reports on vaccination. If you also want to wish team Khushi baby and have some suggestions then comment box is all yours!